Hi! 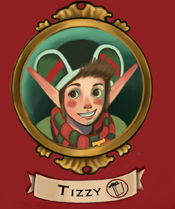 My name is Tizzy. I am one of Santa’s Izzy Elves, and I had a really scary thing happen to me one recent Christmas morning. I was packed by mistake in a present and was delivered to a home by Santa Claus (we elves call him S.C.) with the rest of the gifts. I was just starting to panic, when the two little boys who lived there, Owen and Alex, did something really, really NAUGHTY. They sneaked downstairs and opened their biggest present BEFORE THEIR PARENTS WERE UP. And there I was! I explained to them that S.C. always says that children’s imaginations are powerful. In fact, his sleigh runs on this power! So I figured that Alex and Owen might use their own imaginations to get me back to the North Pole 1) before I missed the Big Elf Celebration and 2) before their parents came downstairs. Well, it took awhile, but they finally figured out how to do it. I won’t tell you exactly what happened, but my story definitely has had a happy ending! She turns them out cleverly, my, she is quick! By the way, Blizzy says she has already told her story to Deedy so she can write it down. It is called Blizzy, the Worrywart Elf, and explains how she figured out where I was on that Christmas morning when I ended up at Alex and Owen’s house. She is very, very clever. That’s one of the reasons she is my favorite lass. Unfortunately, there is one little bit in Blizzy’s story that I find rather embarrassing, but Blizzy says that’s her favorite part!